old in ice machines at six stands at Miller Park in Milwaukee. A cockroach crawling over a soda dispenser in a private club at Mellon Arena in Pittsburgh. Food service workers repeatedly ignoring orders to wash their hands at a stand at Detroit's Ford Field. Sports fans don't always see such health threats when ordering a $5 hot dog and $6 beer at a professional sports stadium or arena. But the violations catch the eyes of inspectors who poke, prod and probe stadium kitchens that dish out a range of foods from burgers to sushi, for tens of millions of fans who eat at major professional sports venues from coast to coast each year. ESPN's "Outside the Lines" reviewed health department inspection reports for food and beverage outlets at all 107 North American arenas and stadiums that were home to Major League Baseball, National Football League, National Hockey League and National Basketball Association teams in 2009. At 30 of the venues (28 percent), more than half of the concession stands or restaurants had been cited for at least one "critical" or "major" health violation. Such violations pose a risk for foodborne illnesses that can make someone sick, or, in extreme cases, become fatal. "[That] tells consumers that they should be very concerned about some of the food that they are eating and purchasing in a lot of these stadiums," said Chris Waldrop, director of the Food Policy Institute at the Consumer Federation of America, a Washington, D.C., nonprofit organization that lobbies for stronger food safety laws. The interactive map above shows stadium ratings and excerpts from health inspection reports. To see the complete list of findings sorted by state, click here. • Chicago: Three of the four stadiums show no violations, but inspectors showed up when the stadiums were not hosting games, with no food being served or prepared, and no workers present. • Dallas: A new, billion-dollar stadium didn't translate to pristine health inspection reports. • Florida: All stadiums scored among the worst when it came to violations cited by inspectors. Inspections are performed by a state agency, and officials say that makes their standards more uniform and stringent. • California: Ten of its 12 stadiums had among the lowest percentages of vendors in violation. California inspections are handled by each county health agency. Health inspectors, stadium managers and food service company representatives agree that it is a massive task to serve thousands of burgers, brats, hot dogs, beers, sodas and more-exotic fares nightly at venues of all types. The pressure to serve so much food fast -- food that's often prepared by part-time workers in cramped conditions -- leads some food safety experts to believe that the risk to consumers calls for more oversight and more frequent inspections, even though no mass foodborne illness outbreak has occurred from food served at a professional stadium. "Outside the Lines" submitted its findings to Dr. Robert Buchanan, director of the University of Maryland's Center for Food Safety and Security Systems. 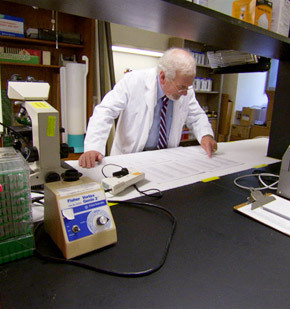 His background includes 10 years overseeing food safety research at the U.S. Food and Drug Administration, which sets the guidelines by which most U.S. health departments conduct inspections. "That number [the 30 venues with a majority of food establishments having critical violations], based on comparisons of the data I've been able to find on restaurants in general, is substantially higher than I would have expected," he said. "Certainly, if you have a high rate of facilities within a stadium coming up with critical deficiencies, that to me strikes of systemic errors in either management of the stadium or in the infrastructure of the stadium, and both of them need to be corrected." "Outside the Lines" found that no league fared better than another. Many stadiums have multiple teams calling the facilities home; food service vendors are selected by stadium owners and teams rather than leagues. Health inspections at the venues can vary widely by state, from when a facility can be inspected to whether fines can be imposed to even how the same violation in two places should be categorized. At most stadiums, inspectors separately review each location, from the concession stands and restaurants to the kitchens supplying vendors hawking food in the aisles, but a few health departments lump several locations into one report. • Temperature: Letting hot or cold foods reach temperatures at which dangerous bacteria can grow, or not cooking hot foods to a temperature sufficient to kill bacteria. • Cross-contamination: Exposing cooked foods to raw foods, such as using a cutting board to chop chicken and then using that same board to cut ready-to-eat tomatoes. • Hygiene: Employees not washing their hands or changing their gloves after touching their face, using the restroom, or handling something that might make hands dirty. • Equipment: Kitchens lacking hot or cold water for hand washing or dish cleaning; refrigerators not keeping cold foods cool enough; and holding units, such as heat lamps, that don't keep cooked food hot enough. • Rodent or insect contamination: Evidence that rats, mice, cockroaches, flies or other pests have been contaminating work surfaces or food. "The yuck or gross factor doesn't do it for me," said Dr. Ben Chapman, an assistant professor and food safety specialist at North Carolina State University. Rats and mice don't make him queasy, but he'll be reluctant to eat at a restaurant where employees don't have access to a working meat thermometer. All reports obtained by "Outside the Lines" classified improper temperatures as a critical or major violation because that's what promotes growth of dangerous bacteria, which can make someone sick and, in rare cases, be fatal. Some inspectors cited food establishments with critical violations if employees allowed the handle of an ice scoop to touch the ice in a cooler or if employees used a plastic cup to scoop ice. A 15-year-old boy in Phoenix died in 2002 after playing in a golf tournament at which he and several other young golfers got sick. The ice had been contaminated with Norovirus, a gastrointestinal illness that officials believe was most likely transmitted by a sick employee who didn't wash his hands before handling the ice. At Tropicana Field -- home of the Tampa Bay Rays -- every one of the stadium's 47 food and drink outlets inspected incurred a critical violation during inspections within the past year, according to Florida inspection reports. Violations include food residue in a cooler, toxic chemicals stored too close to food preparation areas, "slime" in the ice machines and thermometers not readily visible to measure the temperature of hot foods. But Bob Pascal, a senior vice president with Centerplate, which runs concessions at Tropicana Field, said those critical violations are simply recommendations on how the company can improve its processes. He said it's more important to look at whether companies have been fined, shut down or have failed inspections, which he said hasn't happened at Tropicana Field in at least two years. In Florida, an uncorrected critical violation could result in an administrative complaint, which can include fines and eventual revocation of an establishment's license. Florida regulatory officials said no administrative complaints have been issued at Tropicana over the past five years. Other industry representatives said that inspection reports can exaggerate threats, pointing out that minor lapses in a rule -- such as a temperature gauge not being properly calibrated or a precooked hot dog a few degrees cooler than it should be -- can result in a critical violation that really doesn't pose a risk to consumers. "To say it's a critical violation, it sends a pang of fear in the public's mind that they're not being looked out for, and that's not the case," said Richard Andersen, chairman of the Industry Affairs Council with the International Association of Assembly Managers, which represents sports stadium managers and concession companies. "These are moral people. They're trying to do the right thing...the last thing they want to do is have something not go well." Andersen said most violations are corrected on the spot in the presence of health department inspectors. Most stadiums, he said, also use private companies to conduct third-party inspections and food service worker training. "The sports industry has decades of experience serving fans and a proven track record of providing fans with safe, high-quality food options that positively impact the game-day experience," Andersen said. Serving food to the masses also means big money to the providers, teams and stadium owners; as such, the industry is highly competitive. Starting in August, Rojo Hospitality -- an offshoot of the Arizona Cardinals organization -- will begin providing concessions under a two-year, $26 million contract at University of Phoenix Stadium after a competitive bidding process in which it beat out national contenders Aramark and Centerplate. All three companies promised about $5.8 million in profit back to the Arizona Cardinals, Fiesta Bowl and the Arizona Sports & Tourism Authority combined, out of $13 million in annual sales. While there hasn't been a documented mass outbreak of foodborne illness at a professional sports stadium, fans, players and coaches have said they have fallen ill from food, including Red Sox manager Terry Francona, who blamed bad sushi in the clubhouse for a bout of food poisoning he had before a series playoff game in Anaheim last fall. Waldrop and other food safety experts said that many cases of food poisoning go unreported. Even when fans do complain, food poisoning -- which can hit within hours of eating contaminated food or take days to appear -- is hard to prove. Last summer, retirees John and Janet Hunt complained to the Houston Department of Health and Human Services that the barbecue beef sandwiches they ordered while attending a Houston Astros game at Minute Maid Park the day before were "not even lukewarm at best." Dr. Robert Buchanan, director of the University of Maryland's Center for Food Safety and Security Systems, examines the stadium inspection data provided by Outside the Lines. "I was concerned because there was no way that the food was being kept at proper temperature. Heaven only knows how long the wrapped sandwiches had been sitting there," Janet Hunt wrote during an e-mail interview with "Outside the Lines." She said she and her husband suffered vomiting and diarrhea that night and again the next day. One of the most worrisome violations to health inspectors is food not being cooked, reheated or held at safe temperatures, because that's when dangerous bacteria - such as E. coli, salmonella, and staphylococcus aureus - can grow and, if consumed, can trigger nausea, diarrhea, and vomiting. When Houston health inspectors investigated the next day, it was unclear from which stand the Hunts ordered their sandwiches, according to the health department report. Inspectors checked several locations and found no evidence of food at unsafe temperatures. But the Hunts are convinced something had gone wrong the day before. Other complaints to inspectors came from employees, including one food service worker at what is now called Sun Life Stadium near Miami who told them that several small insects were mixed into frozen alcoholic beverages at a stand where workers hadn't cleaned equipment. "The whole stand needs to be properly inspected before hundreds, if not thousands, of fans (are) subjected to the possibility of becoming ill," the complaint states. In that case, inspectors cited the vendor with a critical violation after finding a buildup of slime inside a frozen drinks machine. In the past few years, Lucas Oil Stadium in Indianapolis and Angel Stadium in Anaheim were cited with dozens of critical violations for rodent infestations. The violations ended up on local TV stations and in newspapers. Lucas Oil Stadium faced $3,500 in fines, and the violations in Anaheim angered officials with the city, which owns the stadium. Officials with Aramark, the Philadelphia-based company that provides concessions at Angel Stadium, said they addressed the problem by speeding up postgame cleanup. The stadium's most recent round of inspections included no rat-related violations. Inspectors at Lucas Oil Stadium, where concessions are run by Centerplate, found only one location with a mouse problem during their most recent review. While inspection reports reveal thousands of violations at stadiums nationwide, differences in local inspection rules and procedures make it difficult to equally compare venues. Although most local health departments use some version of the U.S. Food and Drug Administration food code, which is also similar to rules used in Canada, differences exist. 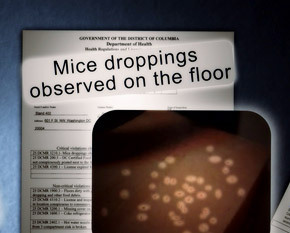 For example, some states consider mouse droppings a critical violation, while others classify them as a minor problem. Even when standards are similar, inspectors vary in how they scrutinize and define violations, said Dexter King, president of the International Association of Assembly Managers. "Different inspectors interpret different violations almost as a referee would look at, 'Should I call this a foul or not a foul?'" he said. Jeff Hershberger, spokesman for the health department in Kansas City, Mo., said inspectors there are strict, and it's common for food establishments of all types -- restaurants, commercial kitchens, convention centers -- to get one or two critical violations. "Things that are critical violations are more likely to be risk factors for foodborne illness," he said. "But the fact is that these critical violations are being caught and being corrected." In Houston, however, inspectors issue critical violations at about half of all locations they inspect, said Patrick Key, a bureau chief with Consumer Health Services in the city's environmental health department. From Key's perspective, a stadium where more than 50 percent of the establishments incurred critical violations "would alarm me," he said. Other factors affecting the number of critical violations: the timing, frequency and element of surprise. In Kansas City, Mo., health inspectors can walk up to the gates of Arrowhead Stadium, flash a badge and walk in unannounced to inspect concession stands in the middle of a game. But before inspectors in Cincinnati are allowed to enter Paul Brown Stadium, stadium officials demand inspectors submit a list of employees' names and make an appointment a few days in advance. Health officials said they comply with the request even though they are not required to by law. "I think everyone needs to be treated the same way. Fairness is the most important thing in the world," said Dale Grigsby, supervising sanitarian with the Cincinnati Health Department. "We walk into every restaurant, grocery store and carryout in the city of Cincinnati ... and nobody is told that we're coming, except the stadium." Reports from other departments also reveal that some stands don't get inspected because they're not open on the one or two visits health departments make each year. In Chicago, inspectors routinely visit pro sports stadiums and arenas when they are empty and no workers are serving food, and will visit them during operation only in response to a complaint. Inspectors found no critical violations at U.S. Cellular Field or Wrigley Field, where the Chicago White Sox and Cubs play, respectively, or at United Center, where the Bulls and Blackhawks play home games. "The time for inspectors to be there is when those places are operating...so that the inspectors can observe them and know whether or not these food safety practices are being met," Waldrop said. The type of violations inspectors worry most about -- such as employees not washing their hands, food left out at unsafe temperatures, and raw food contaminating ready-to-serve food -- can't be detected when vendors are closed, said Jim Chan, health environments manager with Toronto Public Health. The Air Canada Centre and Rogers Centre in Toronto also had no critical violations. Chan said that's a result of his department's aggressive inspections during games. "If no one is present, you can only look at the temperature of the refrigeration units, or turn on the tap to see if there's hot or cold water. You're not able to assess the knowledge of food handlers. Are they careful? Are their hands being washed between [handling] raw and cooked meat? Are they smoking?" Toronto also forces food establishments to post a bright red sign visible to the public every time they get a critical violation, which Chan said encourages strict compliance. Tim Hadac, spokesman with the Chicago Department of Public Health, said his department does a good job of preventing foodborne illness. "The results speak for themselves. In the 20 and a half years since I started at CDPH, I can't recall a confirmed outbreak of a disease linked to a sports stadium in Chicago," Hadac wrote in an email. But food safety experts said inspectors should focus on what could happen, not what hasn't happened. When it comes to sports stadiums, they said the potential risk is great considering the thousands of people served at one time and the challenges stadiums face in following food safety rules. "They're trying to mass produce a whole lot of food very quickly, and there is a propensity to try to take shortcuts just because you've got a long line of people waiting to be served and you really need to get this food out to them as quickly as possible," said Dr. Buchanan, the food safety professor. Watch Paula Lavigne's "Outside the Lines" report about stadium food. Nicholas Casorio, 22, said he understood that pressure when he prepared and served food at Tropicana Field from 2006 through 2008. Food safety experts discuss the challenges and dangers of the preparation, storage, and handling of food at sports arena concession stands. "There's so much volume going through at one time that it's hard to do the necessary things to keep everything clean," he said. "Sometimes you sacrifice the cleanliness for expediting the service." Sometimes servers would pull onions off a burger or grab fries with their bare hands if an order got messed up, or cooks would send chicken out still raw in the center, he said. "In the heat of the moment when things are pushed, they made mistakes like anyone would," he said. A food service manager, who spoke on the condition of anonymity over fears he would lose his job, discusses what he has seen on the job. Casorio's experience is backed up by a study released last month by North Carolina State University that showed in large commercial kitchens, similar to the type used in a sports stadium, workers break more rules as pressure builds to get food out the door. Researchers videotaped food-service workers at eight locations over hundreds of hours and found that, on average, each worker committed about one critical violation per hour. In one incident, a food handler sliced raw chicken on a cutting board and then used the same board or knife to slice a ready-to-eat sandwich. Stadium kitchens also face some unique challenges in complying with food safety rules, said Buchanan. They might have limited space for food preparation and storage, and in open-air stadiums, it can be more difficult to keep pests and insects out, he said. "You often have a staff that's part time, so you lose the opportunity to train them well." Food service companies at several stadiums also allow nonprofit groups to run some stands using volunteers, which have been the subject of complaints and violations. In 2005, health department inspectors in Cincinnati got fed up with repeat violations at Paul Brown Stadium due in large part to non-profit volunteers, said Karen Draper, a health department supervisor who used to be in charge of stadium inspections. "Not wearing gloves, not knowing where the thermometer is, not knowing what temperature it's supposed to be ... leaving the ice scoop lie in the ice bin so they had to stick their hands in there to get it," she said. "Stuff that if you worked in a restaurant you would know not to do." Health department officials sat down with representatives from the stadium and Aramark to address the problems, and both sides said the situation has improved. The company now requires all workers, including volunteers, to undergo training before working in any establishment, and they're closely supervised by a manager, said Aramark spokesman Steven Weiss. "The most important thing for people to know is that food safety is our top priority. There's nothing more important," Weiss said. Waldrop, the food safety advocate, and health inspectors in several cities said consumers should have more access to information on violations and scores in order to determine for themselves whether companies are keeping food safe. "If one vendor has an 'A' and another vendor has a 'B,' people are going to go to the 'A' vendor because they know that's the one that has the safe product, especially in a stadium where you have an enclosed space," he said. "They're going to stay in that stadium. They're going to go to the ones that are getting the good grades." Paula Lavigne is a reporter in ESPN's Enterprise Unit. Her work appears on "Outside the Lines." She can be reached at paula.lavigne@espn.com. Producer Lindsay Rovegno contributed to this report. Join the conversation about "What's Lurking In Your Stadium Food?"